Discussion in 'Falls Creek' started by Bogong, Dec 16, 2009. 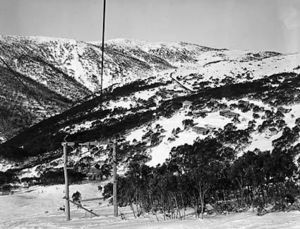 Falls Creek has been discussed in the Old Hotham thread, but rather than derail it, it's probably wiser to start up a separate Falls Creek history thread. Despite strong opposition from the head of the Kiewa scheme, (a benevolent puritan called H.C.C. Williams who didn't want tourists clogging up his roads and destroying his "dry" construction camps by bringing in booze), Falls Creek boomed as much as Hotham, partly owing to it's relatively good access road. When the credit crunch of 1952 led the Kiewa scheme to be halved in size, (today's Kiewa is only a shadow of what was planned), curfews on road use were eased and the place took off even more. Early lodges included Bogong (c.1946), Skyline (1947), Albury (1949), Myrtleford (1949) and Dawn (c.1950). - Monthly magazines published in the 40's and 50;'s: Ski Horizon and Schuss. - Bob Howe. 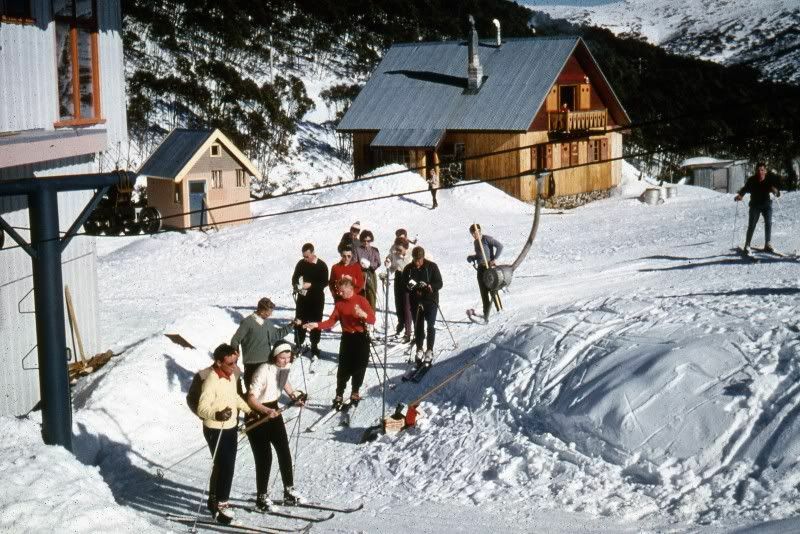 Melting tracks: history and memories of Albury Ski Club and early Falls Creek. The author, 2004. - Julian Newton-Brown. Falls Creek: how it came to be. Janby Productions, 2005. 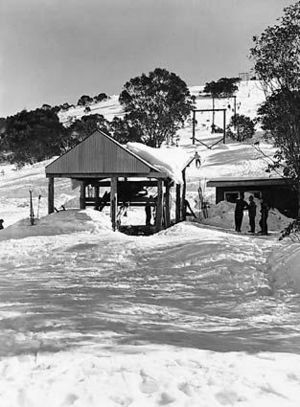 Myrtleford Ski Club also built their own ski lift, I'd really love to know where it was. In a strange way, reminds me of staying at a small hut in the vicinity of the inter poma at FC, in the 70s. I think it was caled RAAF Hut. RAAF folks stayed there. Skyline was built on the quiet by hydro employees who privately obtained a lease of some land in the F.C. bowl. They didn't want this to be known by their boss, as one of them put it " Knowing Williams paranoia about skiing and other forms of enjoyment, it was decided to keep the building activity as secret as possible". So they located it amongst dense trees a fair way from anywhere. Of course Williams eventually found out about it and was furious, so he banned skiers from using the mess hut at Rocky Valley camp. In the early 50's, Bob Hymans (a former pilot in the Royal Netherlands Navy who fought the Japanese in the Dutch East Indies (now Indonesia) and was imprisoned in Changi and/or the Burma Railway), built his commercial Grande Coeur lodge nearby as well as Australia's first chairlift. But the town was developing on the other side of the valley and these were the only two lodges built on the northern slopes. Anyway, Grand Coeur burnt down in 1961. Hymans only died a year or two ago. 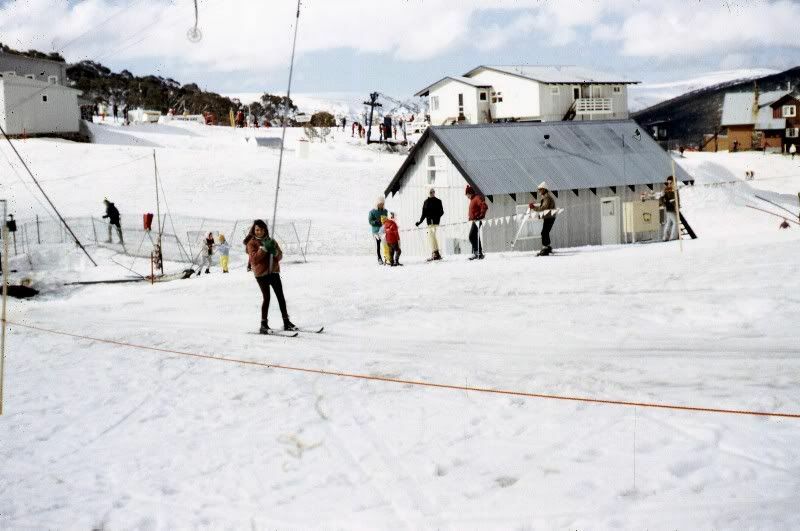 Skyline Lodge eventually passed to the RAAF ski club before being demolished. I don't know when it came down, but I'm surprised to learn that it lasted well into the 1970's. 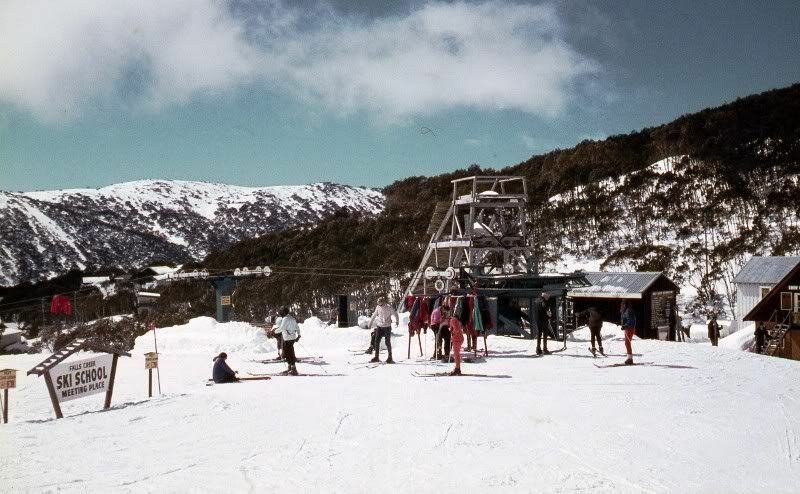 The first chairlift in Australia, Bob Hyman's single chair. It was built from wooden electricity poles... I wonder where he "found" them? Marg Old Diana Lodge likes this. I had the pleasure of meeting Bob Hyman some years ago when I stayed in his lodge, (Forget the name, but someone will know) A fascinating character, willing to share memories and anecdotes. He had a lot in common with Lee Thaw, a Baw Baw pioneer and lift builder. 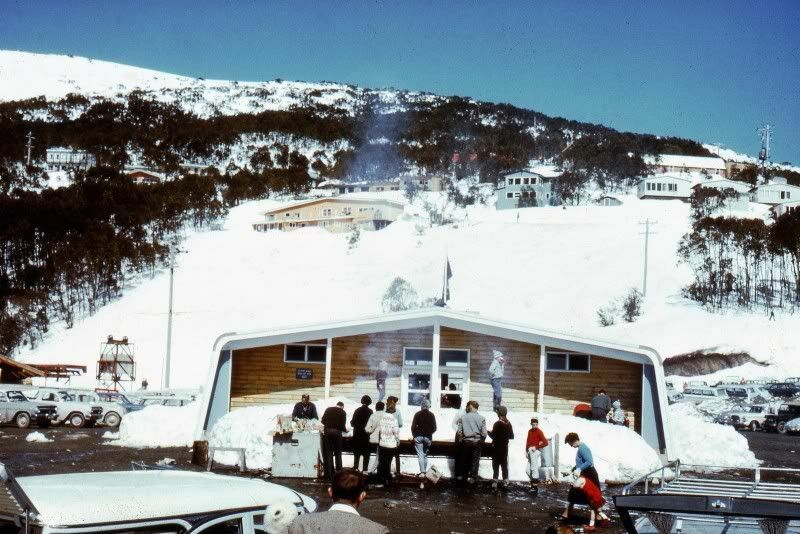 ... Skyline Lodge eventually passed to the RAAF ski club before being demolished. I don't know when it came down, but I'm surprised to learn that it lasted well into the 1970's. Well, 1974, actually. June that year. And vague recollections of visiting in following January. 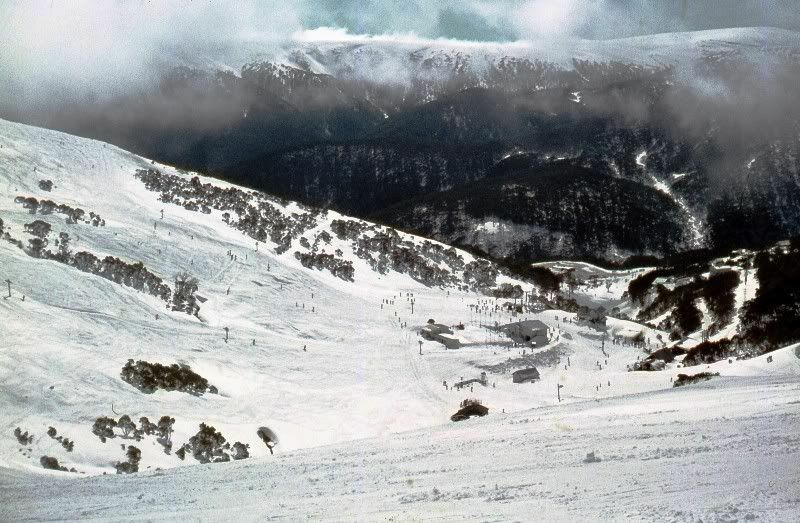 However the SEC were not in agreement and the club was refused permission to use the Falls Creek site, so a ski village very nearly did not come in to being. However by 1946 the attitude of the commission had changed and another group of Commission employees had been given permission to build Skyline lodge adjacent to the road on the south side of Falls Creek. Using this as an opening the members of Bogong Ski Club again applied for their site and were granted Permissive Occupancy of 4 Acres in the Falls Creek area and the purchase of a building from Hume Weir prisoner of war camp for use of the club members. By the 1947 winter a ski village was born. 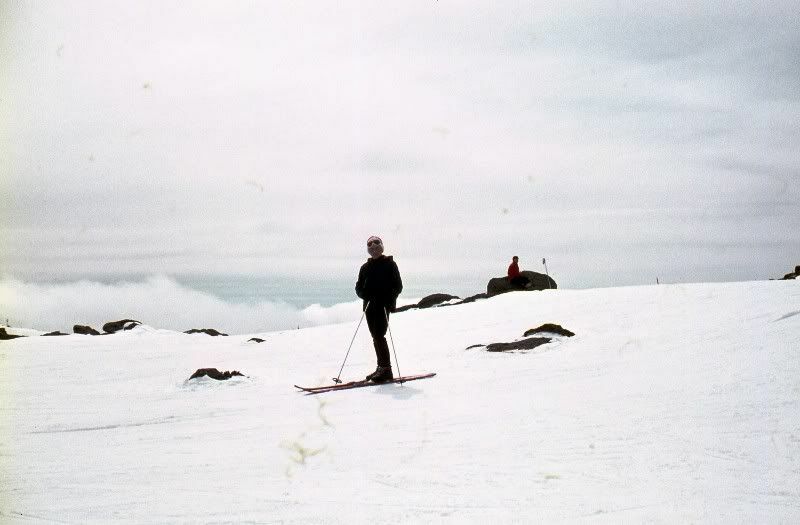 Bogong: is this it? behind the three skiers? Bob had Four Seasons (next to oversnow) and also Southern Cross flats (above Four Seasons, on the other side of Christie St). Ah yes, Four Seasons it was, thanks Curra! Bogong if you want to fill in some gaps of knowledge, next time you are in Falls drop into Nelse and have a chat with Ros Parker, she used to be married to Ory Freauf and probably knows a fair bit from him Also Ted Weekes aka 'Phantom', has been around for a long time and has done a bit of research I believe. VSG, The building you have indicated is Hymans generator shed (marked as such on p. 115 of Julian's book). Skyline was renamed Yeti by the RAAF. It also had a flattish roof and looked a bit similar to the shed. I can only find small blurred photos of it in books or poor resolution pics on yellowing magazine pages. But I will eventually discover a decent picture and find it on an old map. Apresski, Thanks for the tips. I know Ros because Nelse is one of the lodges I hire for my summer hiking tours. Last time I hired Nelse, I squeezed 38 punters and guides in there. She and Graham were the best lodge managers I've ever dealt with for these tours, nothing was too much trouble for them. By comparison most managers of lodges I hire don't like having their summer slack period interrupted and their lodge being full for 5 days and can be a bit grumpy despite my groups always being very well behaved. However, I need to assemble a few rough draft chapters on the history of each resort before I can bail up experts or old timers with requests for colourful anecdotes or precise detail on a few things. Please don't tell Ros and Graham I like them and their lodge so much, or I won't be able to haggle a cheap price for the place! I'm planning another Falls Creek package hiking trip for 35+ people next year and I was thinking about hiring Nelse! great info here guys, thanks for research and sharing... love the old pics! Lynn Gibbs of FCSL is a great collector of photos and the history of Falls. She will have known many of the old timers too. Well it's just possible my comment was directed at someone else! Hi, first I shall introduced myself ! I am Mireille de Mulder (Hymans) Bob's ex-wife and mother of Eric Hymans and his two sisters Brigitte and Chantal. I am now living in Belgium, my birth country. I am writing to this forum because I have lived in Falls Creek (year round!) from April 1954 to August 1959. I have seen the Grand Coeur Chalet being built and also the first chair lift. With Bob's clients I have participated to many sky hiking journeys to Spying Kop and some other places, which names are escaping my memory.... I have some photos, mainly in the snow, they are still in relatively good conditions and could be edited for you all if you so wish ? To my knowledge Cecil Dobson is still alive, living in Mount Beauty, he has been a companion of Bob and I when I first arrived from Europe and then moved on with Orest, they both kept a little grocery store. Also in Mount Beauty is Alberto Costa (maried to Shirley a nurse at the hospital) who first came to work for Bob around 1956 when he was 19yrs and had just arrived from Trieste - Italy. Bob has also used the services/help of Bernhard an Austrian ski instructor and his firend Mark (not sure of the name), they both belong to a small group of Austrian family, Trudy , 14yrs at the time who later became Bernhard's wife and was the first woman ever to give birth at Falls Creek during the winter season while we were snowed in! My english is getting rusty ! My memory is still relatively good and if necessary I can try answering queries ....Hope to hear from anyone of you, any time !!! seychellian, TC and Scott No Mates like this. You have a fantastic background and insight to add to the history of Falls Creek , and im sure taht a number of people have some questions for you. It would be great to see some photographs scanned up on this website if that is possible? as im sure they would be great . Pat Lawler and Marg Old Diana Lodge like this. Pat Lawler, Marg Old Diana Lodge and ladycamper like this. Scanned some of my Dads old slides. Excellent snow cover. Bear in mind this was the era before snowmaking. and great shots!... we stayed in Skyline(Yeti) a coupla times in the mid 70s ... off season. Dad was RAAF. I used an EPSON Perfection 4490 Photo flat bed scanner. It's a midrange multipurpose scanner. Does prints, slides, 35mm film negatives. Has holder for the slides and film. Does 4 slides at a time or a couple of rows of negatives. There are better faster ones specifically for slides but I had negatives as well, plus you might want to scan a regular document as well. Takes a while but definately worthwhile. All the old shots I posted (color ones in Buller forum) are slides put throug a a unit from DSE. Problem is it only take 1GB SD card so you need to shift image files off it a fair bit if you have a lot to do but otherwise works well. There are a few types here. 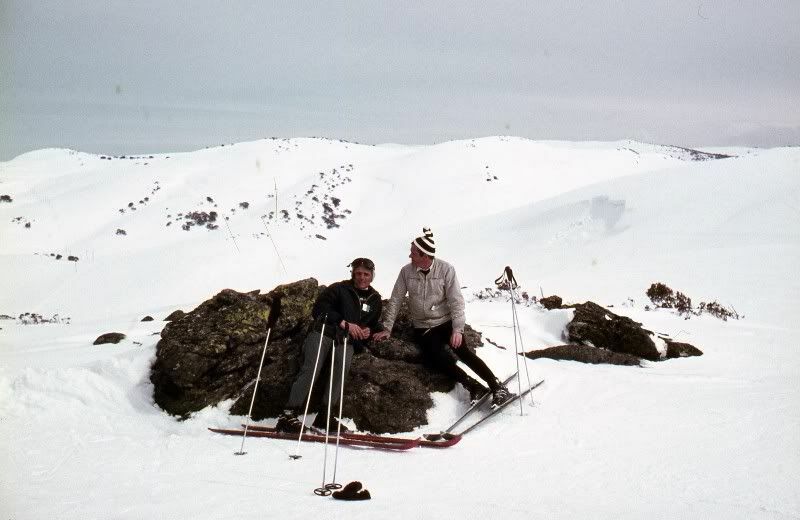 There was a documentary on SBS a while back about the early days of skiing in Vic. There was a fair bit on Buller and also I think Falls. They interviewed a few of the pioneers including,I think, a guy called Max who moved onto Baw Baw and was still living there when he was interviewed. I taped it at the time so must see if I still have it. I found the tape and had a quick look at it. It's from 1984 and really interesting. There is footage of Orrie(sp) Fruehauf, Ernest Forras and quite a bit on Malcolm Milne. Great stuff. There was a photo of Falls from 1981 where they had 15' of snow. I remember almost drowning in snow out the back of Baw Baw, must have been the same year. Bring it back! 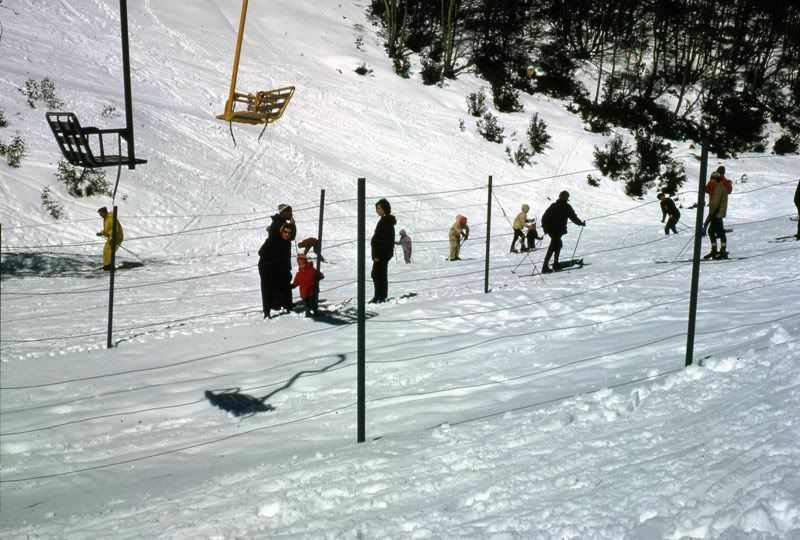 I wonder if that's me - the one sitting down - I had a jacket in denim blue colour, and I started skiing in 69 or 70 (at 14 or 15). Nice to see a pic of the old ski jump. Village bowl - can't remember what this lift was called. The last pic would be the former Nusery Poma. Guys, take a study of pic #2. You can see there is a queue of skiers on the base of the slope upon which the Country Club now stands. There is a small box to the right of these folk. It looks like a lift queue, and there are a few folk snowploughing down the slope. The nearest lift would've been the Gully Chair, so what can be made of this queue ? Is that small box a ticket box ? Then again, at a closer glance it may just be the students lined up for a ski class. Looks like all those people standing in a line have planks on thier feet....maybe a ski class side stepping up the hill? My memory is a bit vague on that. The gully chair would be just out of view on the right of the pic. The box I think was probably a ticket office for the gully chair. The people would be skiing down from the lodges. 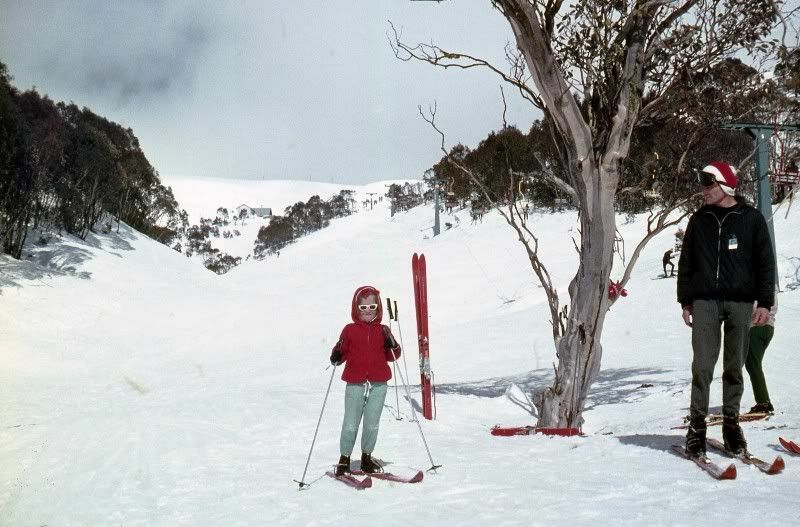 I do remember that from the gully chair you would either ski straight down the gully or wind your way along the road past the lodges and then down the last bit you see. Nor sure what the people lining up were doing. That slope is where later (late 70's early 80's?) the Sundance was built. Some of us were tobogganing down that slope until we were told off as there was a toboggan slope around the corner. And yes, nursery poma sounds about right. The sundance was such a lovely place!!! Would photos from '79 be too modern for this thread?, mainly FC and Buffalo.. now where the hell did I put them? JuJu, they would be great. Anything that makes the oldies nostalgic or is entirely new to the youngsters is welcome. 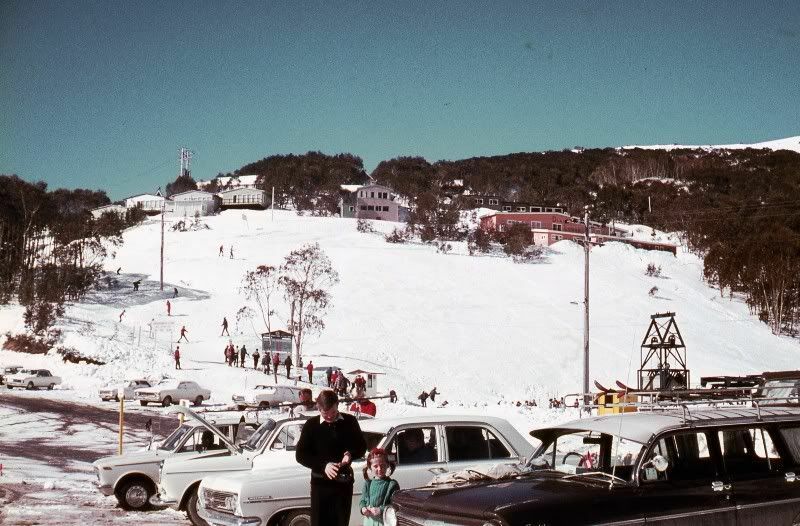 I've just received word from Lyn Gibbs of Falls Creek Lifts that Falls is putting together a museum at Snowland and that they are seeking vintage photos. If anyone has some nice hi-res scans of vintage photos of Falls Creek they would be happy to donate to the project - please email myself or ian and we'll arrange a file upload. If you walk around the back of Gebi's you can still see the platform of the base station of this lift and in summer in the grass burried deep the cable is still where it was dropped. My latest project is discovering a bit about the lifts built by Ron McCallum. He was associated with Bill Bridgeford's Alpine Developments Holdings, the company that bought up most of the lifts at Falls in the early 60's and in 1961 McCallum replaced the nutcracker lifts on the Summit and Village runs with T-bars of his own design. 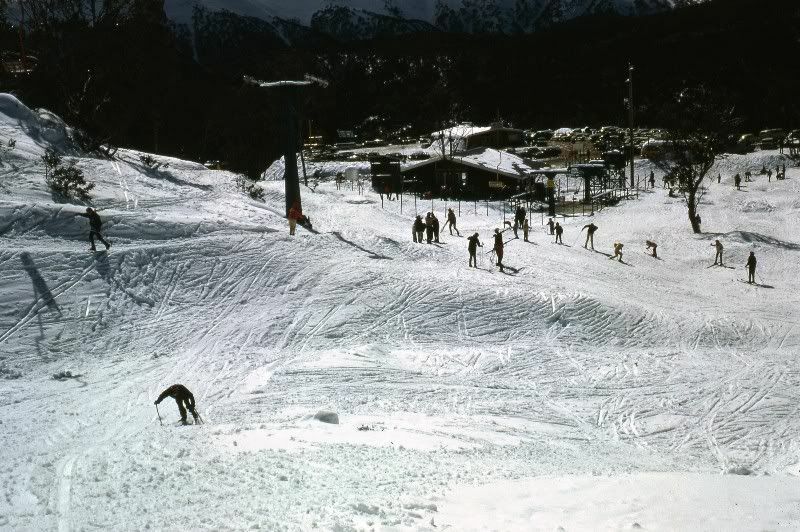 I know for sure that in the 1960's he also built the chairlifts at Portsea, Caribbean Gardens (Melb) and Perth Showgrounds, but does anyone know if the Sun Valley T-bar and first Gully Chair were McCallum products or were they bought from a foreign lift maker like Pomagalski, Riblet or Doppelmayr? It appears he may have also built Boggy Creek T-bar at Buller and a few others, but information is sketchy. Have you seen this article http://mornington-peninsula-leader.whereilive.com.au/news/story/murphys-lore-ron-mccallum/,tou may be able to get in touch with him via the newspaper. Coincidentally I notice he flies out of Tyabb, as does Judy Pay, daughter of Bill Bridgeford. Snowduck, I used to ski down that slope in photo 2 before they built the Sundance (now Country Club) in 1980/81. It was up and running for 1982 season certainly with Chris Box and John Shepherd running it. Box ended up as head lessee at Hotham (Arlberg) and - the less said the better. Shepherd I don't know - was in OIl (?) in Sydney at one stage I thought but no idea now. The ticket boxes at the Gully Chair were actually off to one side originally then later a bit further up the gully, well before anything like Gebis was built. That yellow box rings no bells for me at that time. Awesome thread, Bogong, and thanks everyone for contributing to it. I love the history and looking at pictures from a past era, and hearing stories of how the resort came to be. Keep it up, everyone!